More details have emerged regarding the upcoming Google phone called Nexus One. Tnkgrl Mobile who has had a hands on with the device has confirmed that Nexus One, like Motorola Droid on Verizon wont support multitouch, out of the box. Not atleast in the two apps (Browser and Google Maps) that she tried out. There’s no multitouch support in the browser or in Google Maps. The lack of multitouch may however, be only limited to the model sold in the United States. Motorola too, has a separate version of Droid, called Milestone for European and other countries that supports touch gestures in the browser and other apps bundled with the phone. It is also to be noted here that the lack of multitouch support on Nexus One has nothing to do with the hardware and OS, which is fully capable of multitouch gestures. Due to some agreement, she was not allowed to capture video or picture of the phone, but she has confirmed the following hardware specs of the unit she tested. Nexus One is extremely thin, thinner than Droid and iPhone 3GS. Comes with 4GB microSD card as pre-installed. Capacitive OLED screen with almost the same size and resolution as the Motorola Droid. 3G will work only on T-Mobile USA. No 3G on AT&T (EDGE only). It is unlocked. You can use it with any carrier you like. It appears to work faster than Motorola Droid. No multitouch in Browser and Maps. No dedicated physical key for camera. 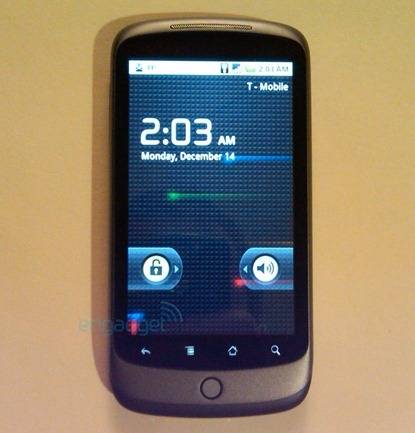 The trackball works almost exactly similar to other HTC phones like HTC Hero. 5 MP camera is on board. The performance of camera is decent in low light, but the flash is weak. It uses micro USB connector for both data and power. You can check out the complete specifications of the Google Nexus One phone here. Google is expected to announce the availability of Nexus One phone soon, with the rumored launch data of January 5th and a price tag of US $199 for the subsidized version. You gotta remember – “unlocked” doesn't mean the same thing in the US it does everywhere else in the world. You can't use it on any carrier you want, you can use it on T-Mobile, or AT&T if you're willing to forgo high speed data. Not Verizon, not Sprint. It's a GSM Smartphone, which severely hampers its utility in the US. Basically you get TMobile without a contract.